A branded mobile app can be an excellent marketing opportunity for businesses – but only if consumers actually use the app on a regular basis. Creating a branded app is easier than ever, but boosting engagement and user retention is a bit more challenging. If you’ve already built a custom app and landed a spot on a consumer’s mobile device (that is, they’ve downloaded your app), then congratulations, you’ve passed the first hurdle! However, smartphones have a limited capacity for storing apps, so you have to earn your position by consistently providing value and giving users a reason to engage with the app. 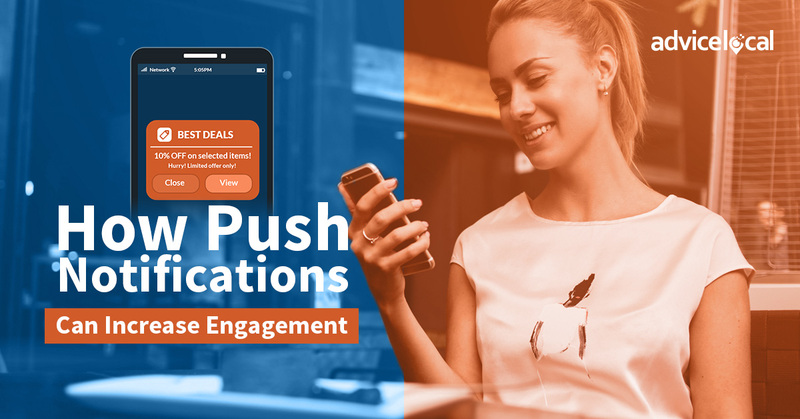 One way to boost engagement and remain top-of-mind for mobile consumers is through strategic push notifications. A push notification is an alert sent from an app to a mobile user’s home screen when the app isn’t in use – sort of like a friendly nudge that encourages consumers to re-engage. Whether used to introduce new promotions, motivate users to catch up on recent activity, or remind them to review a mobile receipt, push notifications present a valuable opportunity for brands to reach out directly to their audience. After downloading an app, mobile users must opt in to receive push notifications – so it’s important to make it easy to do so. But it’s equally important to make it clear that consumers can opt back out if they ever change their mind. This gives consumers a sense of control and increases the likelihood that they’ll agree to receive notifications in the first place. By downloading your app and allowing you to send push notifications, consumers are giving you a direct line of access to them. It might be tempting to send as many notifications as possible to keep your business on their mind, but spamming will reflect badly on the brand and likely lead to the app being deleted. Be respectful of your customers’ time and only send meaningful notifications that serve a clear purpose. Not all push notifications are relevant to all consumers. Categorizing notifications into different types, such as activity alerts, updates, and reminders, allows users to customize their settings and opt out of specific alerts without turning off notifications altogether. Plus, this prevents users from getting annoyed by notifications they don’t care about – a mistake that could lead to your app being deleted. Don’t waste the potential of a push notification on a coupon that won’t thrill consumers. Instead, stimulate engagement by sending notifications that offer real value, such as deals that customers will actually want and special bonuses only available to mobile users. The more irresistible or exclusive the offer, the more consumers will want to re-engage with your app and your brand. Want to start engaging mobile customers with a branded app of your own? Request your free demo of Advice Mobile today and discover how easy it is to customize an app for your business!